Your bathroom is one of the most important rooms in your home. It often sets the mood for the rest of your day. Therefore, it is essential to make sure your bathroom is a place you enjoy spending your time. However, if your bathroom needs an update, you likely know that it can be exceedingly expensive to remodel. If you are interested in updating your bathroom without breaking the bank, take a look at our guide! If you are trying to save money on your remodel, one of the best ways to do so is by refinishing your existing fixtures and materials instead of replacing everything. This goes for nearly everything in your bathroom, from your shower, to your tiling. For example, if your shower’s floor has yellowed or cracked, rather than replacing the entire shower, you could re-finish the showers floor for a fraction of the cost. The same goes for your tiles. If you have a couple of cracked tiles, don’t replace your entire bathroom floor, just the tiles that have failed, and you will save a considerable amount of money. While your shower might fit perfectly on the other side of the bathroom, if you are trying to remodel on a budget, moving around your plumbing can be your worst enemy. There are few things that ratchet up a remodel’s price faster than moving around all of your plumbing. If possible, leaving your fixtures in their current locations will save a lot of money during the remodel. If it’s not possible, you can consider making minor adjustments yourself, but if you are moving your plumbing, it’s best to leave it to a professional. One of the things that can quickly drive up the cost of a remodel is not planning ahead. If you don’t have your bathroom remodel properly planned, you can end up ordering materials you didn’t need or want, which will cost you time and money to fix. Furthermore, if you are trying to cut down on expenses, consider designing your remodel yourself. While a professional remodeling company will be able to assist you and make your project simple and easy, designing it yourself will save you a considerable amount of money. 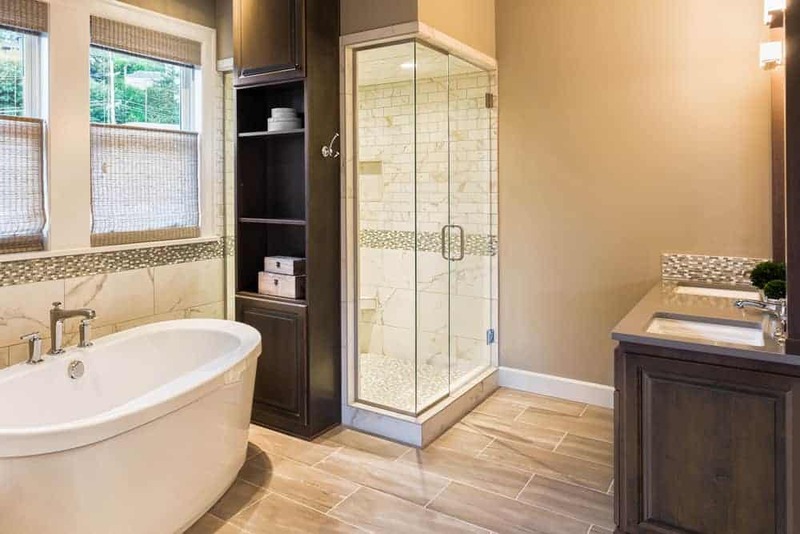 If you are considering moving any fixtures, you are better off contacting a remodeling professional, but if not, you can attempt to re-design your bathroom by yourself to save money and give yourself a sense of accomplishment! If you have more questions about remodeling your bathroom, reach out to our team at Ryann Reed! We would be happy to assist you with any of your interior remodeling needs! Contact us at (215) 372-0040 or by filling out our online contact form! We look forward to hearing from you! © 2019 Ryann Reed Design Build. All right reserved.